A new study suggests that Russians have become more tolerant of corrupt practices in the years since the fall of the Soviet Union. Russia ranks among the world’s most corrupt countries in international ratings, with corruption-related crimes costing an estimated $2.5 billion in damages between 2014 and 2017. Observers have said that anti-graft campaigns under Putin’s rule have brought little progress, while anti-corruption protests have increased in the country over the past year. 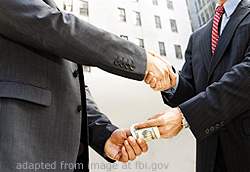 Negative attitudes toward various forms of corruption have decreased in Russia by almost one-third in the past 27 years, according to a study by sociologists at Moscow’s Higher School of Economics (HSE). “Intolerance towards bribe-taking, cheating on taxes, avoiding paying for fare on public transport and claiming government benefits without being entitled to them, have considerably decreased,” the authors said, citing 1990-2017 World Values Survey polling results. Aversion toward bribe-taking has decreased from 85 percent to 58 percent; tax-avoidance from 53 percent to 36 percent; fare-avoidance from 52 percent to 24 percent; and claiming benefits without entitlement from 65 percent to 35 percent, the study said. “Acceptance of such violations has increased more sharply in the years of stability under [President Vladimir] Putin – from 2006 to 2017 – than in the wild 1990s,” the Vedomosti business daily reported Monday, citing the results of the survey. “This trend generally suggests that new norms are being established in Russia, under which people consider deviant behavior permissible,” the publication cited co-author Anna Almakayeva as saying.